As maroon crowds swarmed into Hamilton, excited whispers mentioned the likes of Rock and Roll Hall of Famer Patti Smith and R&B legends Earth, Wind & Fire. The village doubled in population as alumni, parents, and friends fled back to campus for the University’s three-day Bicentennial Kickoff Celebration starting Sept. 21. When combined with Family Weekend and homecoming, the festivities provided a continuous stream of special events. In addition to the celebratory moments, the schedule included a number of opportunities to reflect on Colgate’s 200-year-long history. Jane Lagoudis Pinchin, professor of English emerita, and Professor of history Jill Harsin appeared with Provost and Dean of the Faculty Tracey Hucks ’87, MA’90 to discuss the impact of female students and faculty on Colgate, post-1970. At a Shabbat service and dinner, student co-authors spoke about writing Repression, Re-invention, & Rugelach: A History of Jews at Colgate. On Saturday morning, Becoming Colgate author Jim Smith ’70, former Bicentennial Fellow Jason Petrulis, and Harsin discussed pivotal moments in the University’s past. The following day, the University showed a preview of Path of Duty, a new documentary that examines the lives of three African American alumni. Filmmakers Zeron Turlington and Nicole Watson joined Vaughn Carney ’68 and Diane Ciccone ’74, P’10, who inspired the work, to discuss their motivations in making the film. They cited a lack of representation of African American students in Colgate’s 200-year story and their hopes to participate in offering a more complete history of Colgate moving forward. From lectures to concerts, from fireworks to the homecoming tailgate, there was something for everyone. 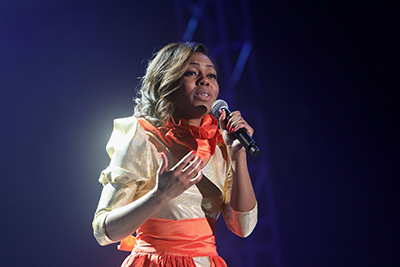 Here’s a look at some of the moments and behind-the-scenes preparations that made the weekend. High note: As Colgate prepared for Bicentennial Kickoff weekend, a legendary opening act took the stage Sept. 20. 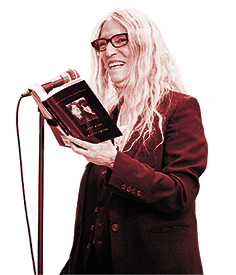 Patti Smith, singer-songwriter and author, appeared as part of the Living Writers series. Smith read from her National Book Award-winning memoir, Just Kids, and she performed a number of her greatest hits relating to the passages. It’s not every day you hear of an ingredients list including 570 eggs, 4 liters of red food coloring, and nearly 50 liters of milk, but that is exactly what alumni couple Britty (Buonocore) ’12, MA’13 and Brendan O’Connor ’09 tallied when they set out to prepare the Bicentennial cake. 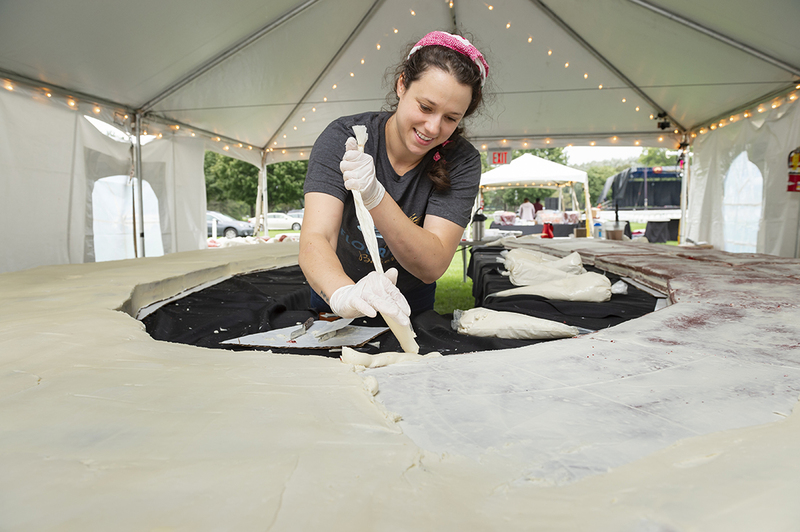 Colgate tasked the Flour & Salt bakery co-owners with providing a red velvet cake for 2,000 attendees in the shape of a 20- by 20-foot C resembling the new logo. Brendan calculated how many cakes it would require and figured out how to form the shape of the letter. Then, for the month leading up to the Bicentennial kickoff, Britty and her assistant baker made 40 18- by 26-inch rectangular sheet cakes. They spent almost two weeks whipping up vanilla buttercream frosting using 225 pounds of confectioners sugar and 112 pounds of butter. Then, the bakers lightly frosted, refrigerated, and refrosted (a technique called crumb coating) these dual-layer cakes before tightly Saran wrapping and storing them in a walk-in freezer. On the morning of the Bicentennial kickoff, Facilities Department members helped transport the cakes to Whitnall Field, where tables placed in the shape of a C awaited. For four and a half hours, the couple constructed the two-cake–wide C while Flour & Salt staff frosted it. A crowd of 7,753 fans at Andy Kerr Stadium watched the Colgate Raiders kick the Lafayette Leopards’ tails 45–0. The Raiders wore vintage 1932 throwback uniforms for the homecoming game, which resulted in Colgate’s largest margin of victory in a shutout since defeating Lafayette 47–0 in 1945. 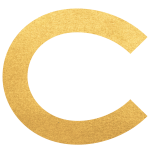 The letter C appeared many places during Bicentennial weekend — including gold pins, embroidered maroon hats, and banners throughout Hamilton. 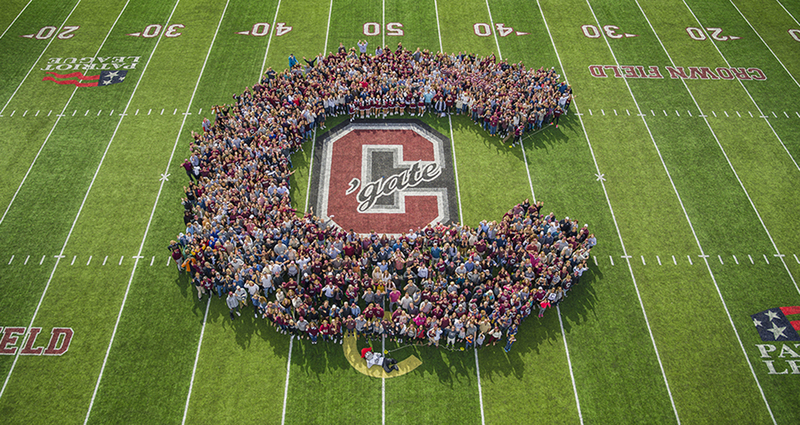 But the most impressive display was when Colgate community members joined together to form a human C during halftime at Saturday’s homecoming football game on Crown Field. Staff members from athletics, alumni relations, and the special events committee came up with the idea, and professors helped execute the plan. First, in order to determine what points would make a perfect C on such a large scale, math professor Will Cipolli superimposed the new Colgate logo onto a proportionally accurate football field background. He then used precalculus distance calculations from known points (hash marks at certain points of the field) to determine coordinates. Then, theater professor April Sweeney used her background in immersive theater to provide insight into the best way to position people and encourage participation from the crowd. Under her advice, people would first form the outline of the letter and then others would fill in the empty space. On game day, recruited students — women’s hockey and men’s basketball athletes — created the outline, as they’d rehearsed. Next, approximately 1,100 participants fled onto the field to complete the formation. “We were all a part of Colgate’s history together,” Alena Maiolo ’21 says. Do you remember the 22nd night of September? 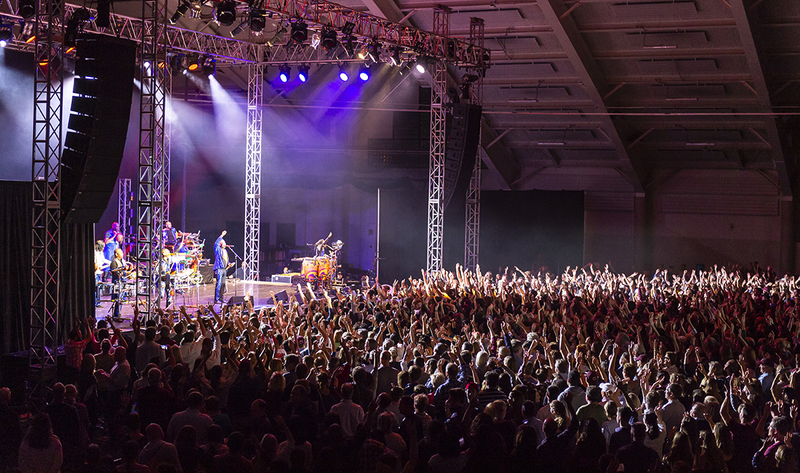 The elements collided on Bicentennial Kickoff Weekend when nine-time Grammy Award–winning band Earth, Wind & Fire performed in Sanford Field House on Sept. 22. When the R&B legends took the stage, audience members tossed around LED-lit balls as the renowned ensemble performed favorite tunes including “Shining Star,” “Let’s Groove,” and “Jupiter.” After the encore — “In the Stone” — the band handed out song sheets and drumsticks as memorabilia for fans. The band encouraged the crowd to sing along — uniting alumni who were fans back in the ’70s with students hearing the classic tunes for the first time in what proved to be a memorable night. Didn’t make it to campus? The festivities continue throughout the 2018–19 academic year, traveling to cities around the world and linking the Colgate community online via the Bicentennial website at 200.colgate.edu.